Could California Boating Congress amplify voice of recreational boaters? SACRAMENTO — The booming sounds of foghorns or other loud marine notification devices were not heard reverberating through the legislative halls of the Capitol building in Sacramento during the first few hours of March 2017. Members of the recreational boating industry hoped to at least use a megaphone to garner the attention of state legislators as they congregated on Capitol Hill on March 1 to tackle the most pressing issues California’s anglers and boaters face today. Marine Recreation Association, or MRA, brought the California Boating Congress back to Sacramento this year for a second time; the first one-day conference was held here in 2016, bringing recreational anglers and boaters together in hopes of playing a larger role in shaping California’s boating and outdoor policy. Attendees attended seminar sessions on abandoned vessels, boater education, taxation on boat purchases, a phenomenon called “shakedown litigation,” and efforts to increase fishing participation. The $64,000 question, however, is whether the California Boating Congress gains substantial traction in establishing recreational boaters – and the industries they support – as a constituent base with a voice loud enough to be heard by policymakers at local city halls, Capitol Hill and Washington, D.C. While this year’s California Boating Congress was well attended – there were about 200 industry leaders and government officials who filled the conference hall and three breakout rooms – the ultimate litmus test will be whether organizers can convince boaters from all over the state to attend. Some of the roughly 200 people who attended this year’s lobby-themed conference said the California Boating Congress is probably the largest event of its type. The California Boating Congress should be on every boater’s to-do list, if anything but to have a voice on the issues directly affecting him or her. Attendees at this year’s event, for example, were given a detailed list of tips for talking with elected officials and armed with information on topics directly affecting anglers and boaters. The California Boating Congress is also an ideal opportunity to connect with heads of top state departments and agencies. California State Parks Deputy Director Lynn Sadler and Department of Parks and Recreation Director Lisa Mangat both attended this year’s boating conference. We’re only two years into this noble gesture so the verdict of whether the California Boating Congress’s attempts to raise the profile of recreational boaters among state legislators is still out. Of course recreational boaters generally have a voice on the national level through the National Marine Merchants Association (NMMA) and American Boating Congress. Also on the national level is BoatUS, which represents about 500,000 recreational boating members across the country. The consumer advocacy group offers its paid members several services and also advocates on behalf of boaters on major issues such as ethanol and federal outdoors legislation. The Congressional Boating Caucus was founded on Capitol Hill in 1989 as an informal and bipartisan attempt to bring Representatives and Senators together to advocate for recreational boaters. Recreational boaters are also well represented at the state level in Florida, Maryland, Michigan and New Jersey, for example. Boating themed education and legislation are also cornerstones of the Marine Industries Association of Florida. To be fair, anglers and boaters do have advocacy resources here in California; it’s just a matter of maximizing their respective values. Anglers, for example, have the California Sportsfishing League (CSL) actively lobbying state legislators to draft and pass bills in support of the state’s recreational fishers. MRA’s representatives, in addition to California Boating Congress, are currently campaigning to raise the boating public’s awareness of Assembly Bill 71, a bill in the California legislature possibly eliminating tax incentives for boaters. Yacht clubs have an ally in the Recreational Boaters of California (RBOC) organization. RBOC’s staff consistently campaign on behalf of commodores and yacht club memberships, tackling major boating issues such as ethanol reform, boating safety legislation and other maritime happenings. The RBOC website includes a page highlighting top regional, state and national issues and a “Call to Action” section where boaters can find their elected representatives or take direction on advocating for or against specific boating-themed issues. Meanwhile Boat California, an arm of California’s Division of Boating and Waterways (DBW), promotes public access to recreational boating activities. Of course DBW itself is a shell of its former self, scaled back from operating as its own department in 2013 and reorganized as a division within California State Parks. In 2016 the department held a series of meetings to discuss a possible organizational restructuring of DBW – and potentially giving boaters less representation within California’s bureaucracy. 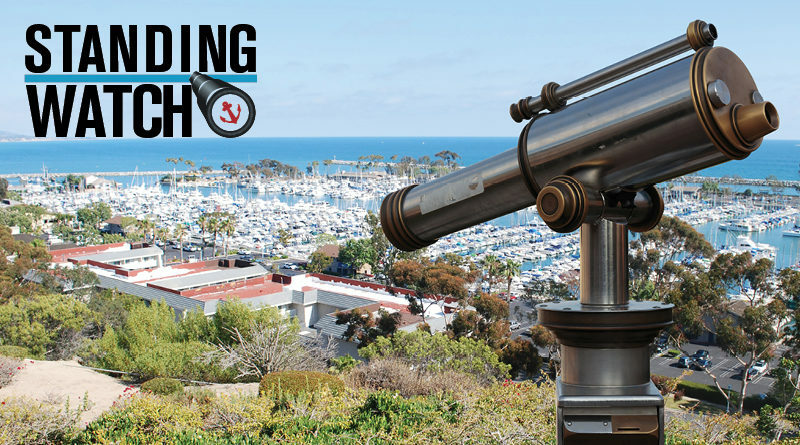 CSL, DBW, MRA and RBOC were all actively involved with the California Boating Congress, either as an organizer or presenter – and major topics confronting anglers and recreational boaters were presented during the event’s morning sessions. The need to keep recreational fishing activity in California affordable and accessible were at the core of separate presentations made by Sonke Mastrup, the former executive director of the California Fish and Game Commission, and CSL Executive Director Marko Mlikotin. Meanwhile a contingency of yacht brokers from San Diego urged marine industry professionals to campaign state leaders to create a more favorable tax scheme to help increase boat sales in California. Representatives on hand from California’s Department of Parks and DBW told attendees what they could expect as the impending implementation of the new boater education law rolls out beginning Jan. 1, 2018. Attorneys from the national law firm Morrison & Foerster advised marina operators and boaters to maintain a vigilant eye on “shakedown” lawsuits, where organizations claiming to be environmental watchdogs threaten costly litigation over alleged violations of the Clean Water Act in hopes of extorting money from marina operators or state agencies. MRA staff intends to bring the California Boating Congress back for a third year in 2018. If held annually the lobby event could become a powerful conduit, connecting recreational boaters and fishers to elected representatives and high-level staffers. Reach out to your local advocate or lobbyist to share your thoughts on ways the California Boating Congress can give you a louder voice in Sacramento.